These are very colorful and tasty Beef Kebabs that are so easy to make, and fun to grill! You can add anything you want that will stay on a stick, so these are mere suggestions. One customer told me they were so tender and delicious she uses them as steaks! 1 pinch chipotle pepper seasoning my personal preference, I like it hot! 4 - 6 pieces jalapenos, seeded and cut up Optional; if you like a little spice and heat...! Place the first 7 ingredients in a ziplock bag and swish around till well mixed. 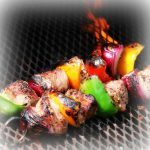 Add the Kabob meat, swish around again till they are all well coated. Let marinade in the fridge for a few hours. Remove Kabob meat from marinade, shake them off slightly. Start threading skewers (metal or wet wooden ones) alternating the Kabob meat, mushrooms, onions and bell peppers (and jalapenos). Grill on medium hot grill for about 15 minutes, turning every few minutes so all sides get grilled. When meat looks ready (not over cooked but not raw), remove from grill. Serve with rice or couscous.